Delivered in 1962 as part of a batch of 22 similar vehicles, 1054 is fitted with a Willowbrook Double Deck body, seating a total of 73 passengers, 41 upstairs and 32 in the lower deck. This batch of vehicles were the first in the Trent fleet to take advantage of a change in the Construction and Use Regulations which allowed vehicles to be up to 30 feet long. This enabled a larger seating capacity. 1054 had an uneventful service life, and was withdrawn from service in 1976 as part of the usual fleet renewal programme. Here its life with Trent would have ended, had it not been for a disastrous fire at Trent’s Meadow Road Derby garage on the night of 23rd July 1976 which destroyed 40 buses and damaged 12 others. This led to the reinstatement of a number of recently withdrawn buses, of which 1054 was one. In October 1977, 1054 was modified for use as a driver training bus. At the time, if a driver required an “all types” licence, enabling the driving of any bus, the test had to be taken on a manual gearbox double deck bus. Part of this conversion involved the removal of the destination equipment and the bulkhead behind the driver, and repainting into the allover white service vehicle livery. In 1987, 1054 was repainted into its original livery of Ayres Red and Cream, to promote Trent’s heritage. It was adopted by a group of Fitters and Drivers, and appeared at a number of rallies. As part of the restoration, the bulkhead and destination equipment were replaced. For a number of years, 1054 saw little use, but was used on free bus services as part of Trent’s 100th birthday celebrations in 2013. 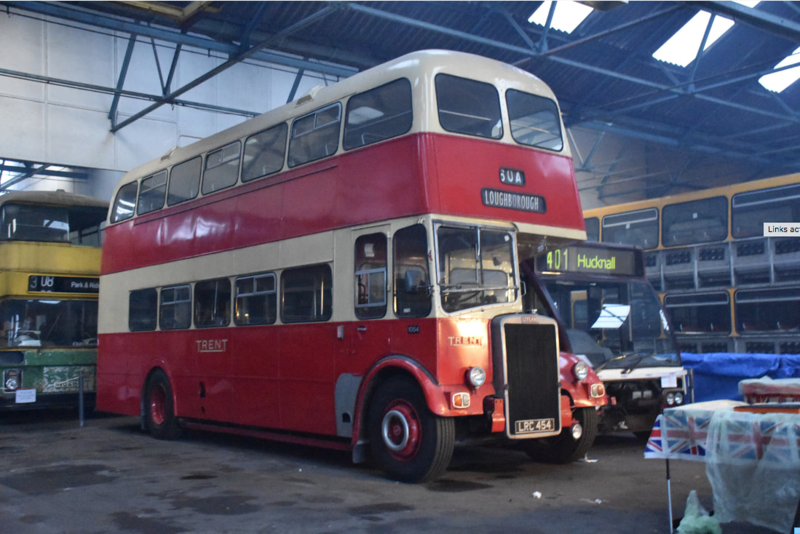 NHVC were asked to provide a home for the bus when we moved into Hucknall garage, and the bus awaits a number of repairs before we can use it on our free bus services. This bus has the distinction of being a “one owner from new” vehicle, having been owned by Trent for 60 years by 2018. It is also typical of a type of bus bought by Trent for many years.